We dragged ourselves away from the marina with the promise of another of the world’s great bridges. 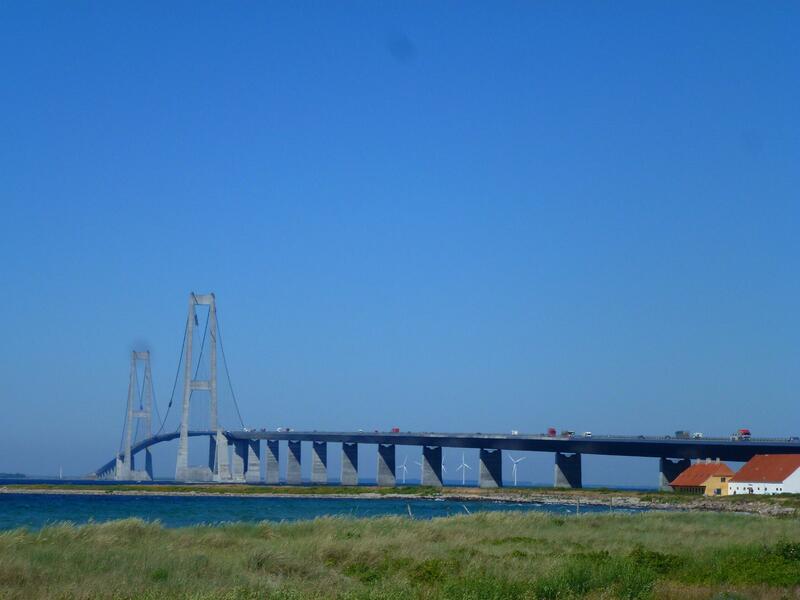 This time the Great Belt Bridge, linking Fyn to Zealand, really two bridges linked in the middle – the box girder bridge is 4 miles long, followed by the suspension bridge which is just over 5 miles. It is one of the most incredible structures we have been on, which is just as well as the toll was a wee bit more than planned. We are under the 6 metres for the cheapest class, but the lady spotted the bikes on the back which pushed us over and another £12 so £35, still worth it though if you are bridge addicts like us. We pulled off at yet another marina and were really impressed as they did meals on wheels – a delicious pasta and a tasty curry were both delivered – gratis :). Or maybe it was the very kind, Tracy and Dave from Deal (small world syndrome – Tracy knows my god-daughter). A very entertaining evening with them and Thomas and Lisa from Sweden, putting the world gently to rights and swapping tales of places been and seen. Much as we thought of staying to see if more leftovers were coming our way we moved on to Copenhagen. Not on our list to see, but there is a campsite in the city centre, plus we needed to drive through the city to get to Sweden so why not. 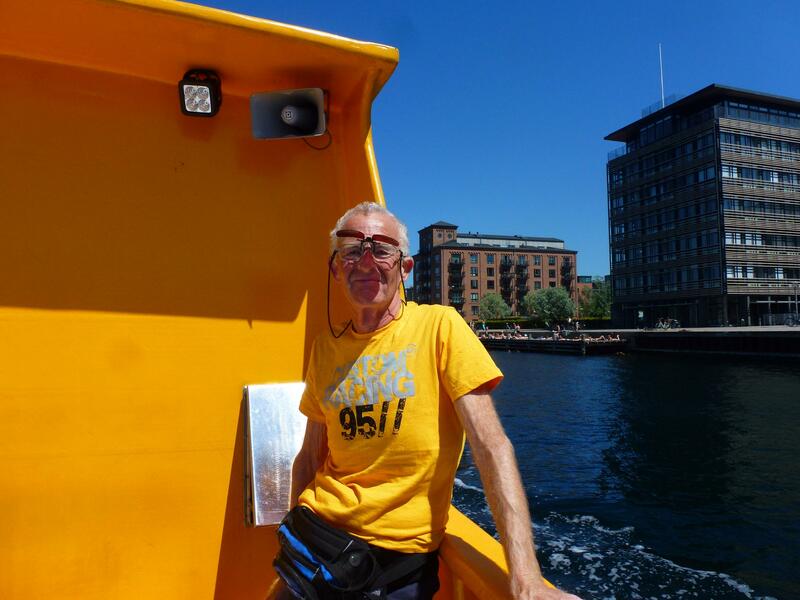 We started our tour around the city with the river bus – excited like two giddy kippers we were. Running from side to side taking photos, whilst the backs of my legs turned redder by the second, its been baking weather all week. Just £2.50 each for the complete river bus tour up and down the city which lasted just over an hour. The next day we headed for the old town and time to tick off some of the must see and do. The Little Mermaid, obviously, along with a couple of hundred cruise boat tours. I will join with the general consensus of every person there “it’s loads smaller than you think it will be”. The brave and the good climb down onto the rocks to get a photo, if not any photo will include the “selfie sticks” of a couple of hundred tourists. 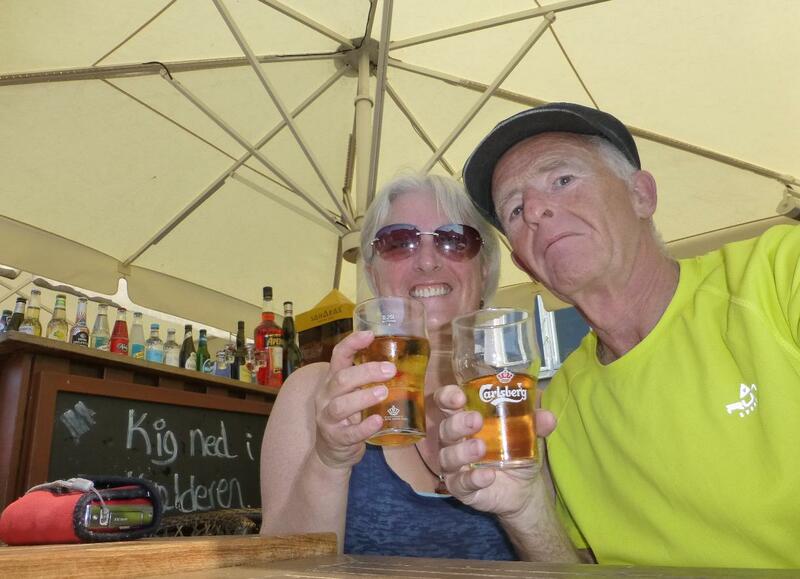 The main must do had to be having a Carlsberg on Nyhaven in the old town. 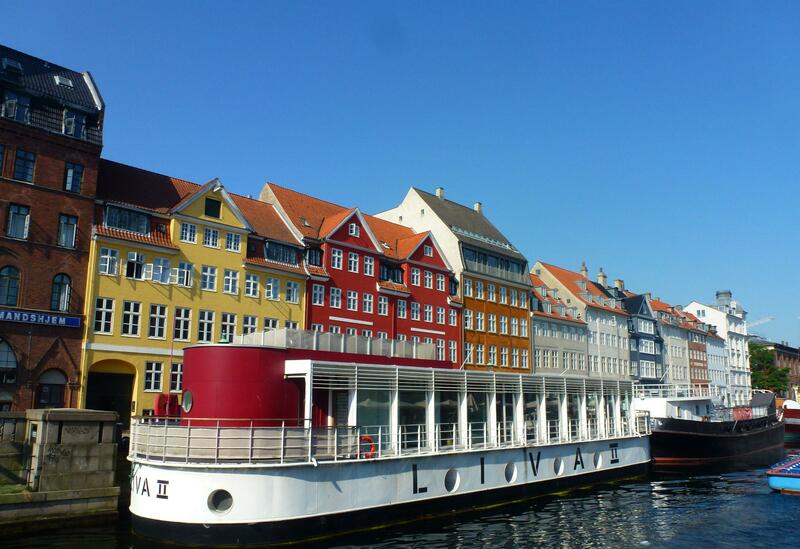 Nyhaven is the iconic Danish view, the old harbour buildings are painted in Tobermory colours, the canal runs through the centre and is lined with stunning house-boats and the quays are lined with restaurants and bars. It is without a doubt a massive tourist trap but it’s none the worse for it, postcard pretty and the place to catch the massive canal ferries that take from 120+ on trips around the city. 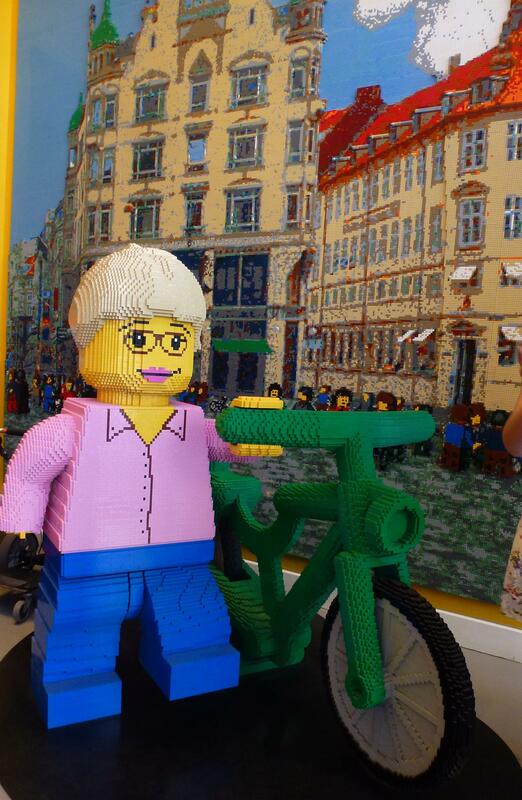 There must be enough to see and do to spend a week in Copenhagen and we only briefly touched the on most of it. The Royal Palaces, the churches, the canals and rivers all deserve a few days. 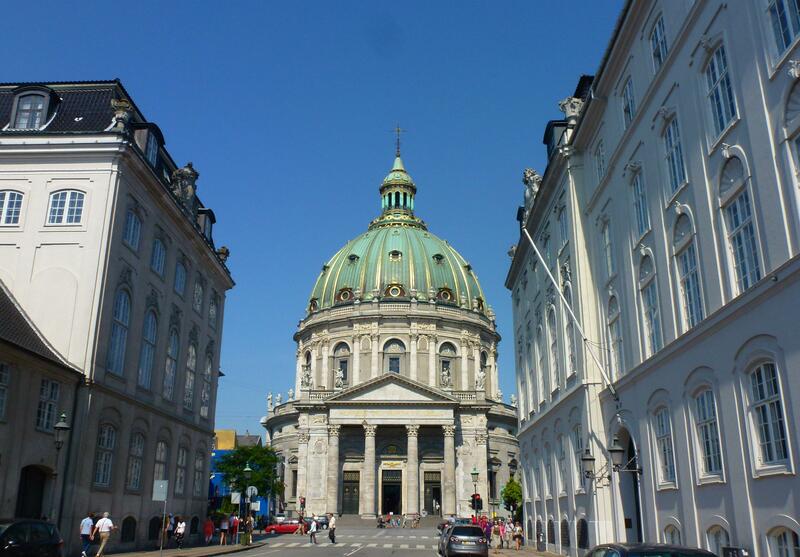 We both loved Frederiks church, known as the Marble church it’s rococo architecture forms the focal point of the Frederikstadn district. Inside hundreds of people were sat in the pews in silence, looking upwards to the 31 metres span domed ceiling, the largest dome in Scandinavia and possibly one of the most beautifully painted. We did have lunch in the old city, our top tip if you are going to try the Famous Royal Smushi cafe as we did – eat well before you go! The tiniest, one forkful of ‘smushi’ each and one bottle of coke between us was £14. Tasty but didn’t touch the sides – it’s not a cheap city even if it is one of the most beautiful. 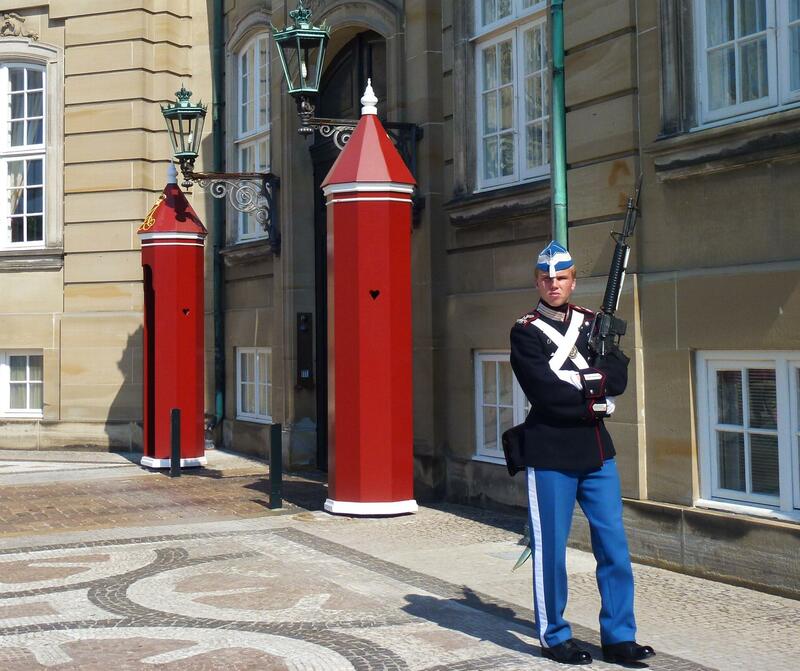 Our last stop was the Amalienborg, winter home of the Danish Royal family. Not just one but four identical palaces facing each other around a courtyard. Not sure how the Royal’s go about flitting from one to the other with a million tourists wandering through, not gated off like most palaces you could wander right up to the front doors. Each palace was guarded by a lone sentry, a hot and unhappy looking four fellas who suffered many. many photos being taken – mine included. With the city temperature gauges showing 34 / 94 degrees it was too hot to do much more and we gave in by mid afternoon. Back at camp we met up with some fellow travellers -known to us as the Woolly Wanderers. Shaun and Jude, plus three adorable poodles have been traveling around Europe for a year too and we have followed their blog weekly, brilliant to meet up at last and discuss the many highs of a year out in a motorhome, including hearing about their exploits travelling through Russia a few months ago. A great evening to finish up wonderful couple of weeks in Denmark – next stop Sweden. 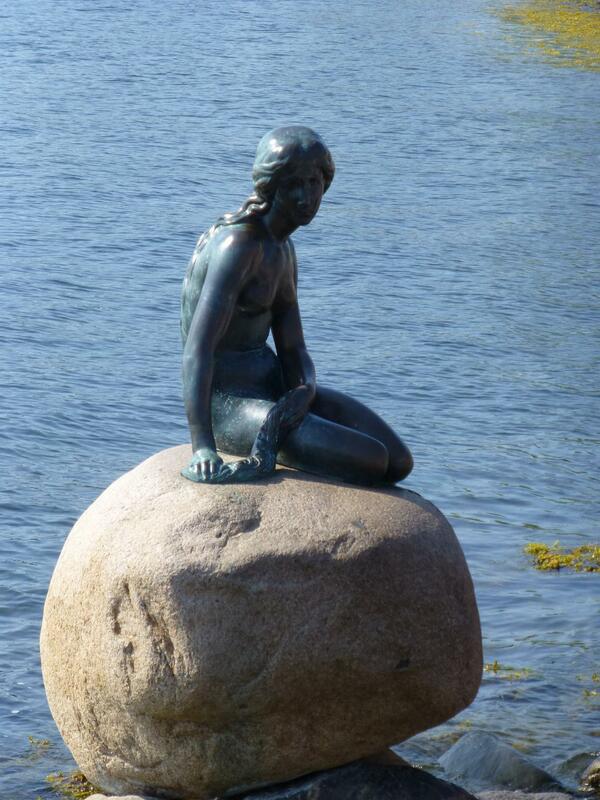 After the beautiful bleakness of Jutland it was a noticeable change in landscape on Funen (Fyn), Denmark’s garden island, being the middle of the three Danish regions or the ‘middle child’ of Denmark, best known for Odense and Hans Christian Andersen. Lots of wheat and barley fields, poppies and cornflowers around the edges of the fields it certainly earns it’s garden tag. 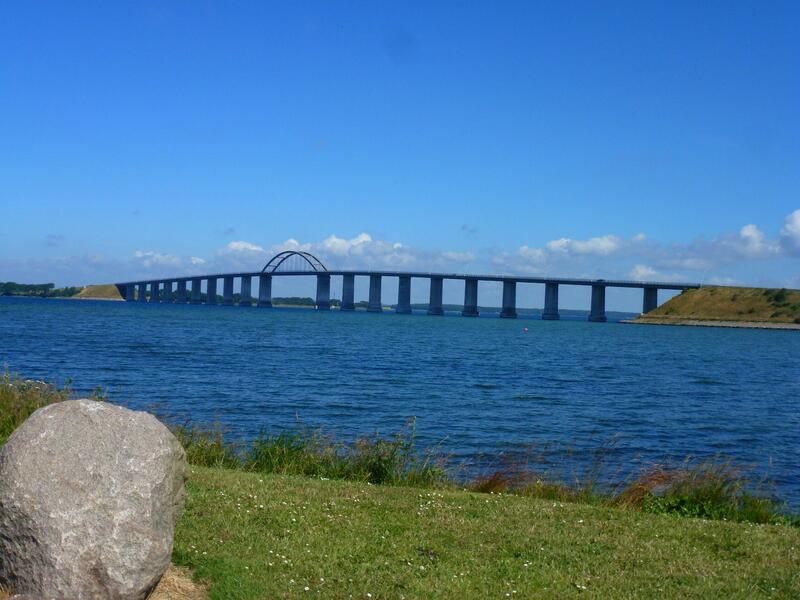 We crossed over from Jutland on the bridge at Middlefart (no way we were going there without mentioning it – childish but made us laugh 🙂 ). We are now in prime holiday season – yet still everyone and everywhere seems very laid back. 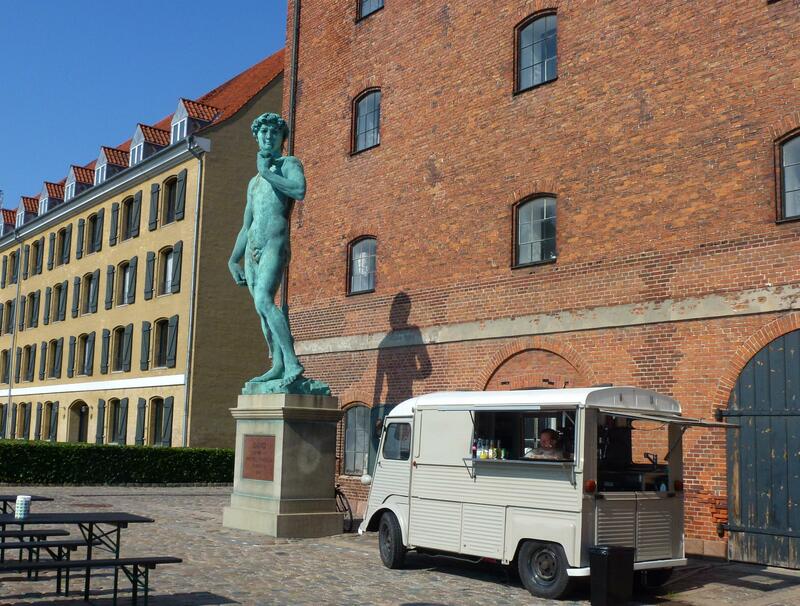 Holiday crowds don’t seem to exist so far, we hear Copenhagen will be busy but all along the coasts its been very quiet, the odd motorhome here and there, plenty of yachts along the coasts but very few cars – all good then. 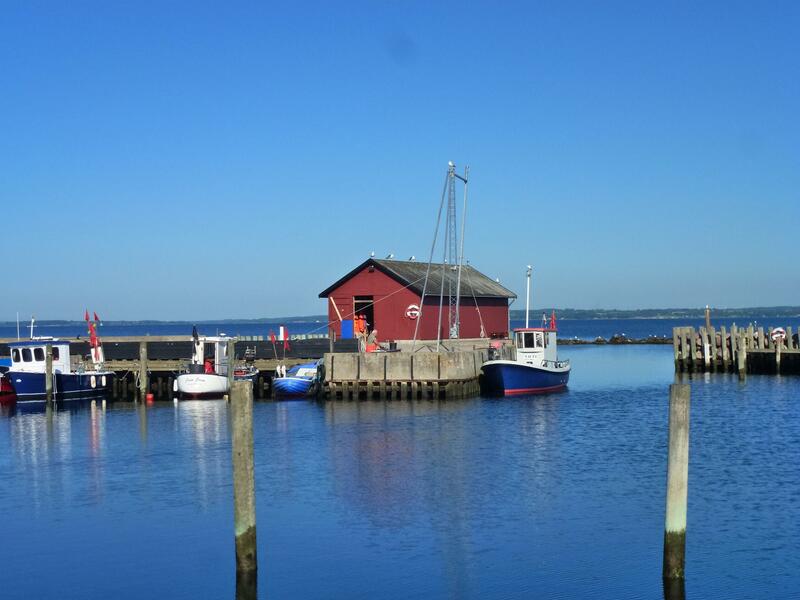 Once on Fyn, Faaborg was our town of choice to visit, mainly because it has a marina, which equals a cheap stopover. 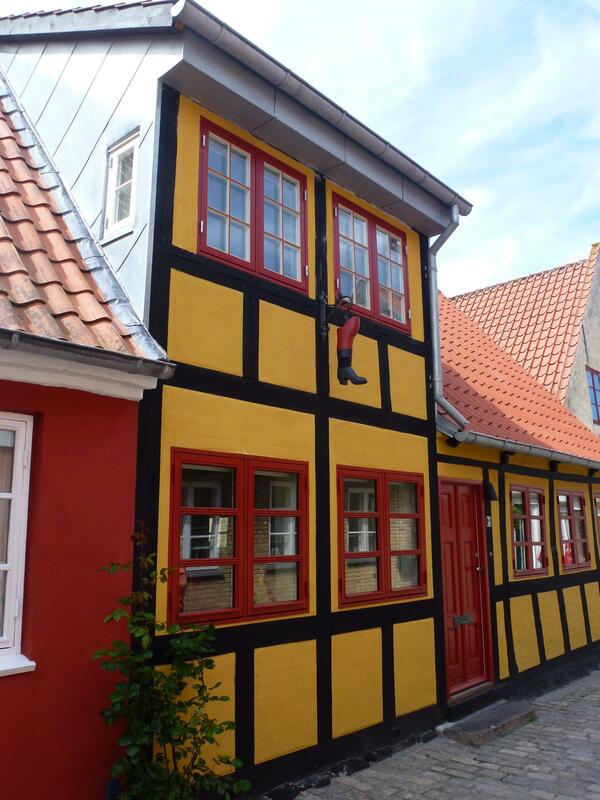 We hadn’t researched the town so were unsure what to expect, we needn’t have worried a typical Danish town, colourful houses lining paved roads. My favourite was the house with the boot hanging off the wall, no signs of it being a shop but would guess it was a boot makers in years gone by. Faaborg boot-makers, once upon a time? 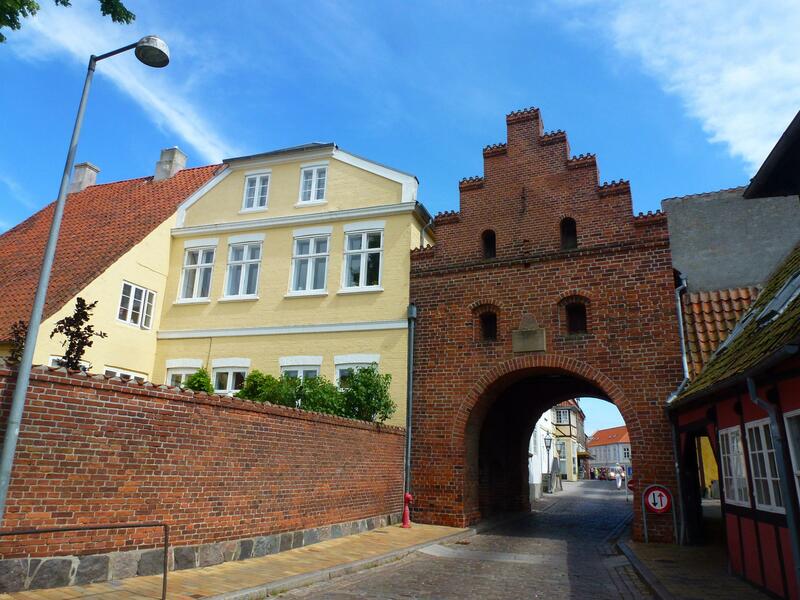 Originally a merchant’s town, the western gate at Vestergade was built around 1400 and is the only one, which has survived in Denmark. The town was just a few minutes walk from the marina so we ambled away an afternoon around the shops. 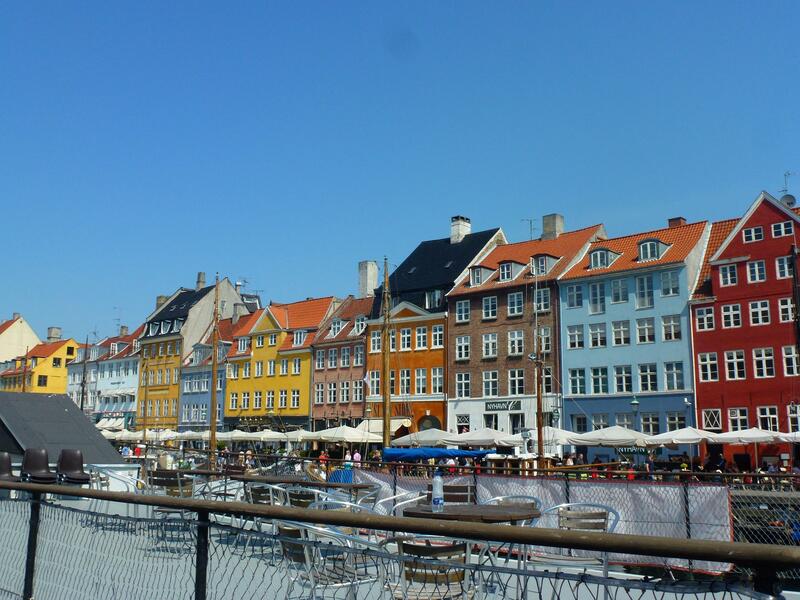 Whilst there are very few empty shops there also seems to be very few shoppers around – the Danes like the outdoor life so we are guessing they are out and about on the water or in the countryside rather than in town. 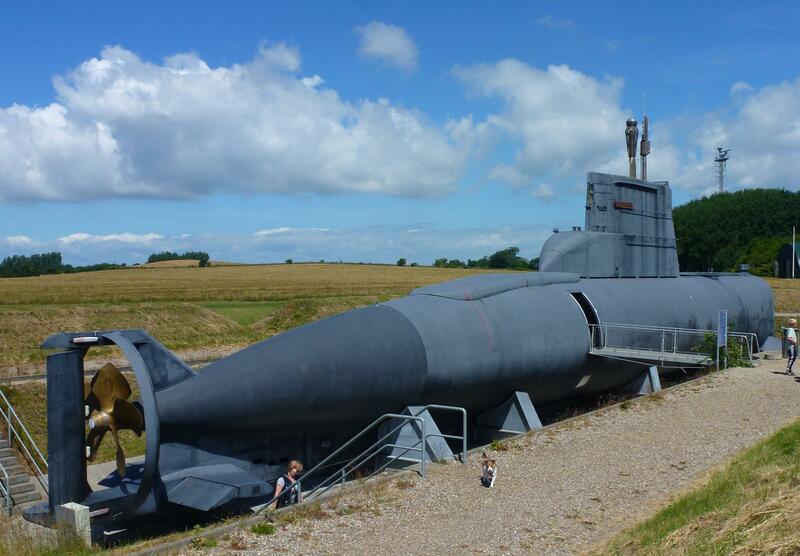 Having visited Plokstine missile base in Lithuania and been on a submarine in Holland I thought all my Christmas’s had come at once (not) when we found out there was a Cold War museum with more missile bases, nuclear bunkers and another submarine on the island of Langelands! 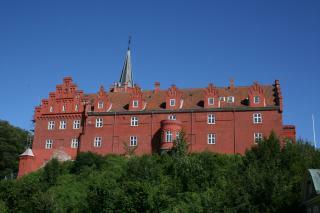 As Iain is a sucker for some Cold War history we agreed to divert South and spend a day at Langeland Fort. At least another excuse for another incredible bridge, this time a short one to a mini island called Sio, then the full 771 metres, 26 metres above the sea over to the island. The fort is right on the Southern tip of the island, built in 1953 it was turned into a museum in 1997 when danger from the cold war was deemed over. The whole experience is one for kids (big and small) to clamber over and on massive naval guns, a decommissioned minesweeper, a submarine, two MIG-23 air-planes and for those wanting the thrill of riding in a armoured personnel carrier the queues were forming to don a protective hat and career across a field for 10 minutes for £10. The submarine was way to hectic, kids were thundering around, that definitely makes you realise how cramped conditions were for people living on them. The main objective of the fort was to delay an attacking Soviet sea force and give NATO flights time to arrive. After touring the base and all the bunkers and fire power the final analysis showed that the most likely outcome of a Soviet attack was the fort would be rendered inoperative almost immediately – supposedly Soviet attack plans included dropping a tactical nuclear bomb on the fort. For a few Kroner it was a cracking afternoon out, the museum even offered for us to stay for free overnight in their car-park. 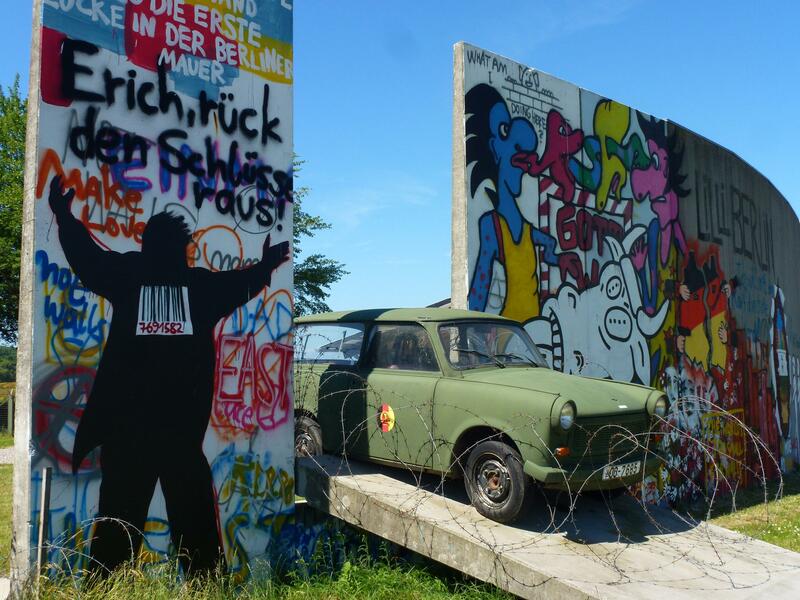 Had we done so it would have been probably the only time we had camped outside the Berlin Wall – a large section of the (imported original) wall is used as a boundary. The weather man seems to have got lucky with forecasts, we have had sunshine since Sunday. With this is mind we agreed to find somewhere to park up for a few days and enjoy some sun, the idea of traipsing through cities or tourist attractions seemed like too much hard work in the heat. We happened across Dagelokke, yet again another harbour but this one is a tiddler. A few houses, 20-30 boats, a cafe and all the facilities we need for a few days. Our friendly harbour master has offered us a free night if we stay for a few days, so we may take him up on that. We treated ourselves to chips for tea from the harbour take-away last night and sat out on the wooden benches watching the world go by – as is often the case the best times are those with a bag of chips in hand!:) . Just up the road is the amazing Tranekaer Castle, built in the 13th century and seemingly as famous for the fact that one of the counts had over 100 illegitimate children as the castle itself. According to our harbour-master Queen Margrethe II stays at the castle several times a year, we are keeping an eye out just in case. 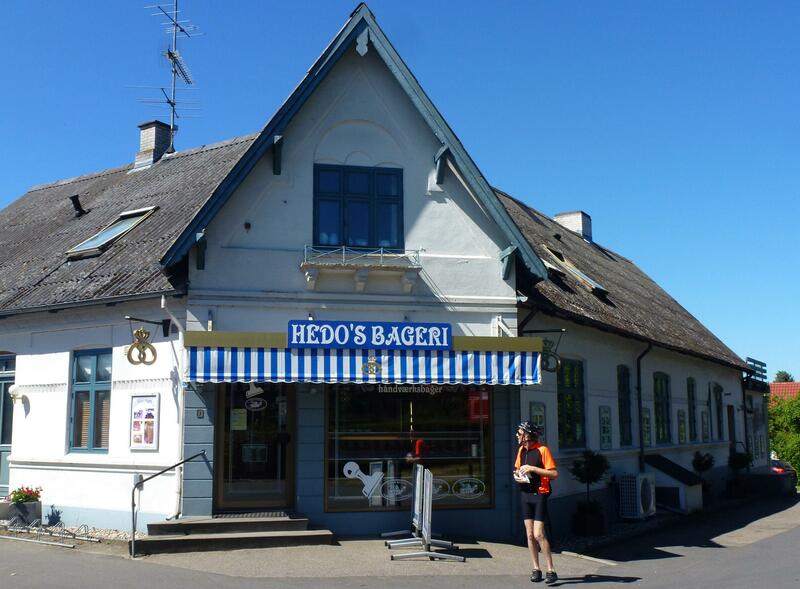 It was too hot today to do much so we cycled to Lohals first thing for a wander around the village and then found the Queen’s bakers, so of course Iain treated himself to some royal cakes as it would have been rude not to! It’s now officially too hot to move and due to get hotter every day til Sunday, here comes summer :).